I’m more of a Blue person but today’s all about Red and Green. At the beginning of last week, I found myself dreaming of Shakshuka and rather than spend getting this dish at a cafe, I decided to whip it up at home for dinner. This dish was exceptionally simple although rather than serve it in the skillet, I found myself eyeing the little Chestnut Pumpkin sitting on our kitchen counter. Now this Pumpkin was a bit of a splurge but being the Pumpkin-eating fiend that I am, I couldn’t help but want to buy it just to see how special it was given its price tag. 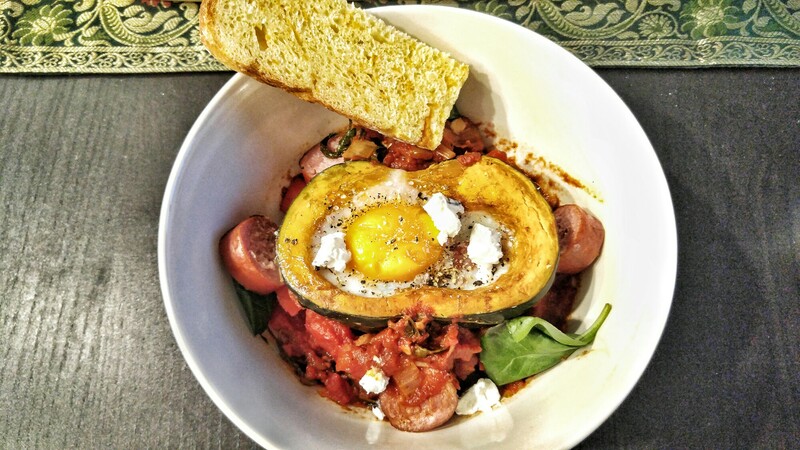 Anyway, I thought I’d be creative and serve Shakshuka in Pumpkin Bowls. I got my recipe off NYT Cooking but made a few changes. Warm oven to 180deg C and place halved pumpkins onto a lined baking tray. 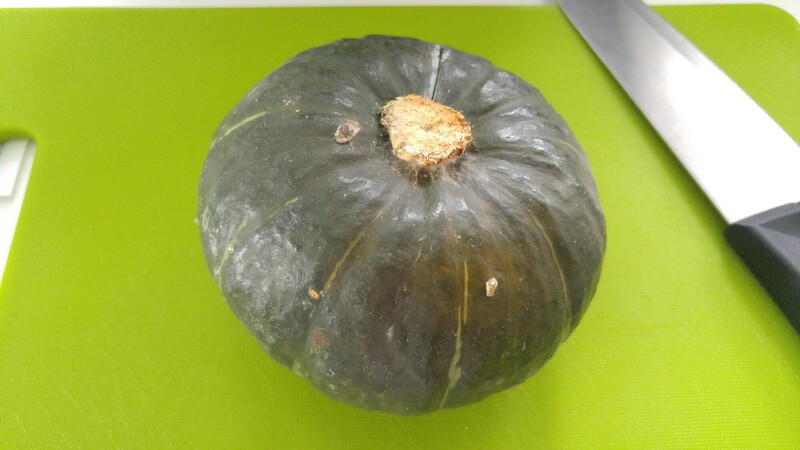 Bake for 40-50 minutes depending on the size of the pumpkin until tender. 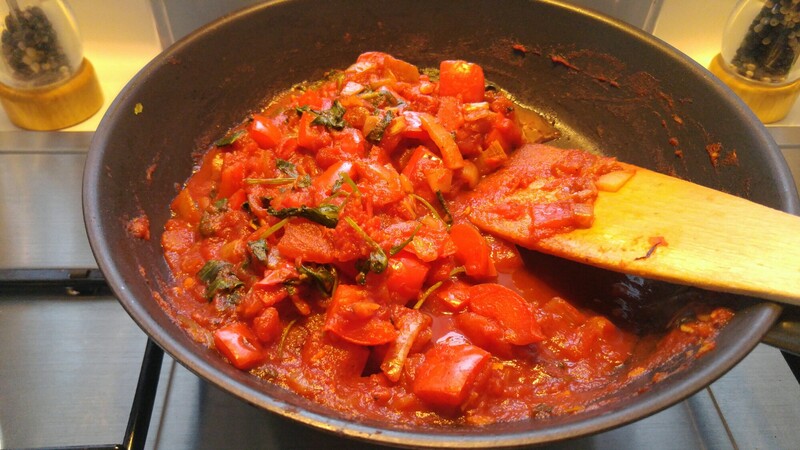 Heat olive oil in pan and saute onions and red bell peppers until softened, approximate 15-20min. Add garlic and stir another 1-2min. Stir in cumin, paprika and cayenne pepper and cook another minute until fragrant. Pour in the tin off tomatoes and season with salt and pepper. Lower heat to simmer and allow sauce to thicken. I had a handful of baby kale left and some basil so I threw both in to wilt. 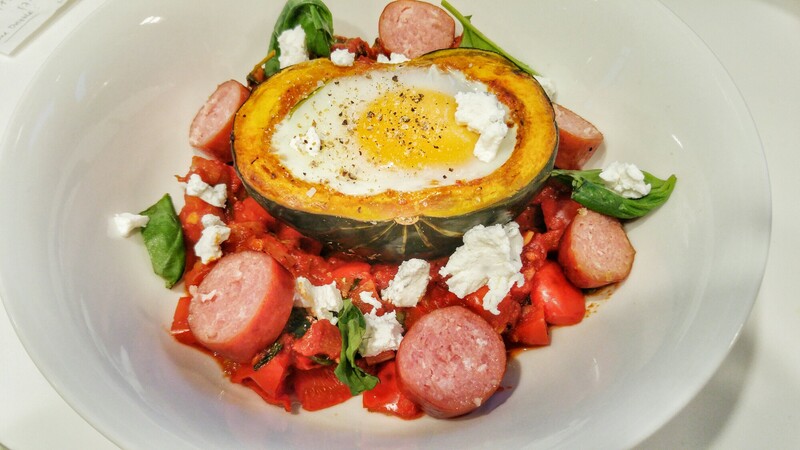 Fill cooked pumpkin cavities with some sauce and top with an egg. Bake 7-10 minutes depending on how set you like your eggs. Garnish with crumbled goat’s cheese and basil. Unfortunately, my little pumpkin halves were too small so not a lot of sauce could fit in and some of the egg white overflowed when I cracked the eggs in. And I ended up having to add more sauce around the pumpkin bowls so perhaps a kind of squash with a bigger cavity might be better, or just a bigger pumpkin altogether. 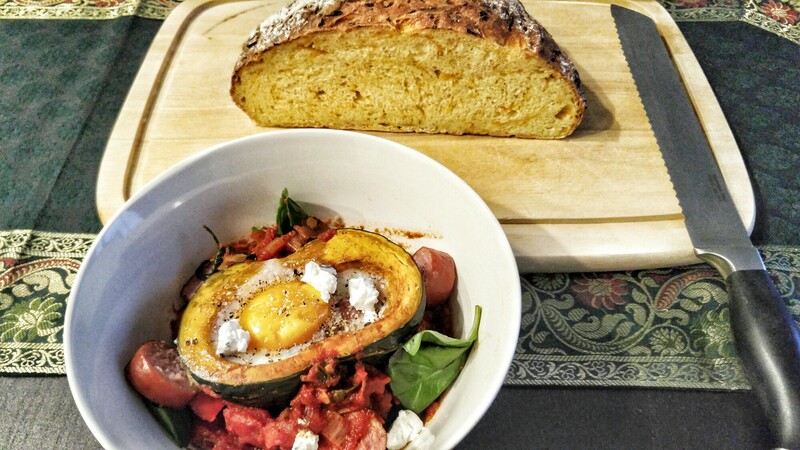 Also, I added some sausage to our Shakshuka just for the extra protein and served it with some homemade Pumpkin Bread that I made earlier that day – I’ll share the recipe soon! Flo loved the tomato sauce and it was lovely eaten with the fresh bread. The pumpkin bowls made it a very filling meal though and we were well-stuffed after cleaning our bowls. As for the pumpkin itself, it was sweet and flavoursome but not worth its weight in cash – our local pumpkin tastes just as good! Following the success of the Red Shakshuka, I decided to make a Green Shakshuka last Thursday night for my dinner. Flo was out with some colleagues so I made it a single serving using Jamie Oliver’s Recipe and downsizing it a little. Mum is a ardent fan of Jamie Oliver’s recipes and so far, they have proved to be very good. 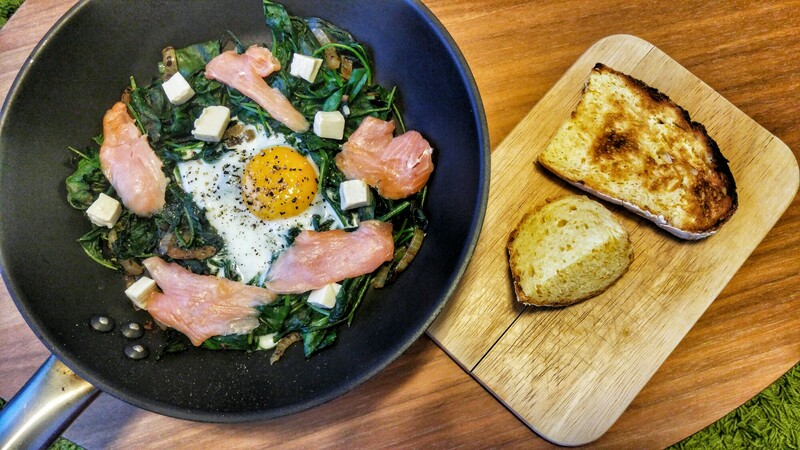 So with such a wide repetoire of Green Shakshuka recipes online, I thought that his would be quite reliable. Of course, not being able to gather all the ingredients meant that I had to improvise here and there. Heat oil in pan and saute onion and garlic until softened. Add dried spices and herbs and cook for a minute. Add spinach, kale, mint and basil and season with sea salt and pepper. Stir for 2-3 minutes until wilted. Stir in vegetable broth and lime juice. 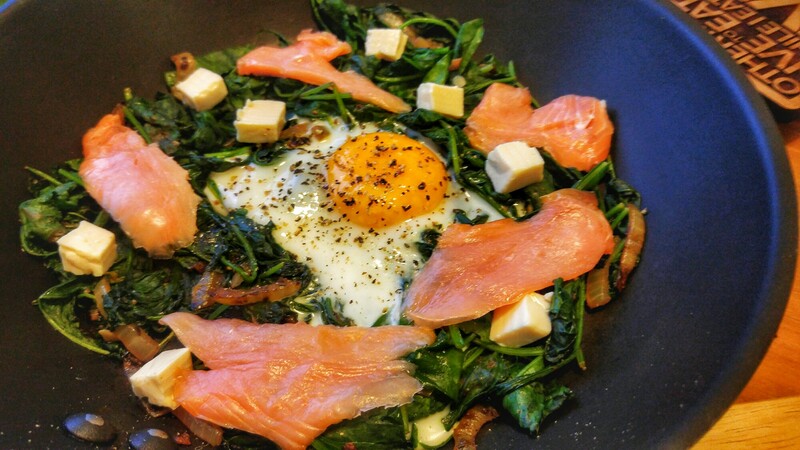 Make a well in the middle of the vegetables and crack and egg into it. Cover pan with lid to steam the top of the egg just to cook it slightly. Season egg with some salt and pepper to taste, sprinkle blue cheese on top and serve with bread of choice. 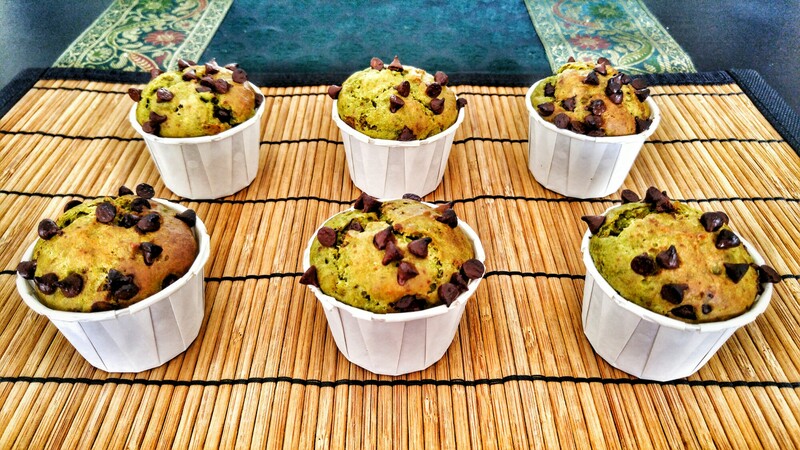 At least until I baked up a batch of Matcha Avocado Muffins the other day. I know that most sweet bakes feature Chocolate along with Avocado but I decided to keep the Superfood Greenies together and allow for the Antioxidants to mingle with the Healthy Fats. With butter being replaced by avocado, I didn’t have too high hopes for these muffins because of my previous attempt at doing the same thing. Looks like it was second time lucky for me because these muffins turned out really well! Again, more dense than their buttery counterparts, but really tasty in a fudgy blondie kind of way. Me likey! Also, I tend to be quite restrained with the amount of sugar that I put into my bakes so the addition of dark chocolate chips to sweeten things up certainly did the trick. So it’s back to the drawing board in this battle between the Reds and the Greens. But where Shakshuka is concerned, red. It has to be red! Previous articleI Love.Coffee Talk & Xiao Long Baos. Amazing recipes! I’m going to try this! And the red version in those pumpkin bowls looks too pretty to eat! Aww thanks!! They were so yummy you should definitely try the red shakshuka recipe. Let me know how it goes! Our first foster dog, Kawaii, just left to his furever home nearly a week ago and we’ve just had baby Truffles join us yesterday. He’s a timid little thing so he’s got lots of room to grow in confidence (and size). Have been cleaning poop and pee since he arrived, though I’m hopeful he’ll quickly learn to use the proper area to relieve himself soon. All the excitement of a puppy and cleaning up after one had me hankering after some comfort brownies. Made these gluten-free using hazelnut flour but don’t be fooled. They’re richly indulgent and immensely chocolatey. I flavoured them with a concoction of cinnamon, ginger, turmeric, cardamom and black pepper, and topped with the roasted cashews. It’s the best way to unwind after countless floor scrubs! Strawberry Coffee Cake with Walnut Crumble. Sometimes the greatest pleasures in life come from the simplest of things. Even man’s Best Friend is deserving of treats. Made these whole-wheat pumpkin treats for our dear doggo which are even healthier than any human treat ever made. Warms my heart when I see him chomping on them (I usually give them in quarters or halves) after he responds to ‘Sit!’. Only works when we’re at home because there’s too much to see and too little time when we’re outdoors. When people ask why my macarons don’t have that typical smooth sought-after shells, it’s gives me the opportunity to say that it’s because I use ground hazelnuts instead of the traditional almonds. Made these chocolate hazelnut macaron shells and filled them with a coconut passionfruit cardamom ganache. Turned out to be a definite hit!